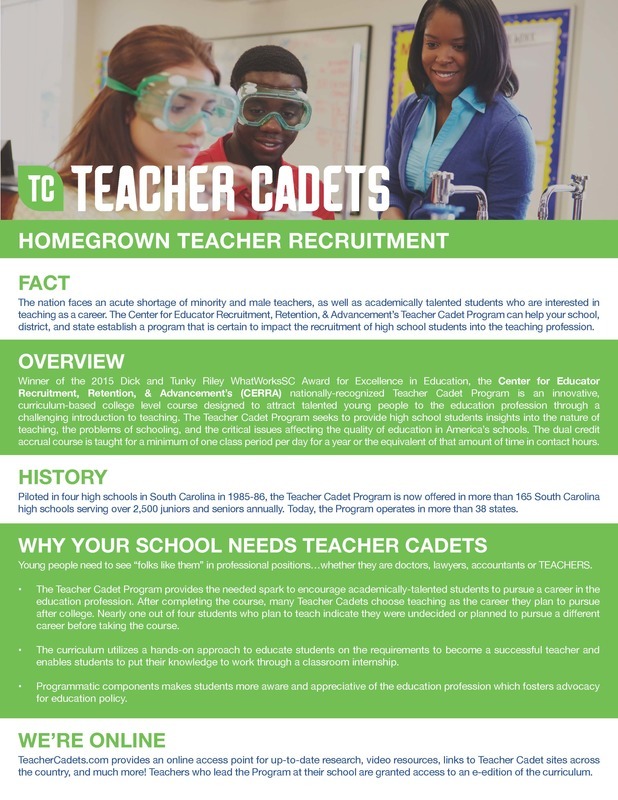 The Teacher Cadet Program is operated by the Center for Educator Recruitment, Retention, & Advancement. CERRA's mission is to provide collaborative leadership in the recruitment, retention, and advancement of outstanding educators for all children in South Carolina. ​CERRA is the oldest and most established teacher recruitment program in the country. The Center for Educator Recruitment, Retention, & Advancement, established by the Commission on Higher Education in December 1985 and funded by the South Carolina General Assembly, entered its 30th year of operation in 2015-2016. Following the passage of the state's landmark Education Improvement Act, CERRA was created out of a concern for the condition of South Carolina's teacher supply pool and a need for a centralized teacher recruitment effort. CERRA also targets groups of accomplished teachers through programs including mentoring, teacher leadership, and National Board Certification. The network of educators in our programs overlaps in powerful ways to increase the level of collaboration for recruitment, retention, and advancement of South Carolina educators. CERRA is staffed by an executive director, two program directors, a business manager, a coordinator of communications and technology, a coordinator of research and program development, the S.C. Teacher of the Year, three program specialists, and four program facilitators. CERRA has developed into a national model for teacher recruitment and its Teacher Cadet Program has been adopted by 38 states (and counting) in the United States. In the summer of 2010, the Center began started receiving inquiries from as far away as Bangladesh. Have you ever wondered how Teacher Cadets started? Check out this interview with Bonner Guidera, creator of The Teacher Cadet Program.